The hike from Listvyanka to Bolshoi Goloustnoe is one of the more popular ones and surely one of the most spectacular. This route in particular appeals the transit traveller, running the Trans-Siberian Railway, for it's easily accessible from Irkutsk. The route is characterized by its constant changes between steep coastal cliffs, beaches and forest with various levels of difficulty. Taking this route you will meet a wide variety of scenery along the shores of Lake Baikal and breathtaking views from enormous rock massifs. The picturesque bays with sandy beaches invite you for a swim or a longer stay making this tour a memorable experience. There are buses and marshrutkas (mini-buses) to and from Irkutsk running several times daily. Accommodation: There are plenty of private rooms, pensions and hotels here. Camping is available at the end of the village. There are several grocery shops to be found (Magazin) for basics. At the harbour markets you can buy smoked Omul (fish). Make sure to buy it fresh. The water in Listvyanka is not of a drinkable quality. 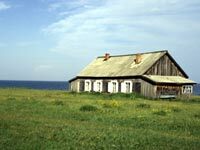 "Baikalinfo" is close to the harbour (accommodation, tours, timetables for buses and ships). The start of this stage is situated in Listvyanka, at the corner of the road along the coast road (ul. Gorkova) and corner of Gudina Road. After a little sign for the Great Baikal Trail (GBT) you have to follow the road through the village and up the side valley of the stream Bolshaja Tsheremshanka. After about 1 km the path forks at the end of the village. There is no sign yet. You should take the left path; the one on the right offers breathtaking views of Lake Baikal and the Observatory but is very tiring with steep climbs. This path joins up with the GBT later on. Take the main path on the left. After going through a couple of clearings, a long climb through mixed forest begins. From there on, the trail is marked by orange GBT ribbons, but only there where it has been made by the GBT. At the ridge of the mountain you reach an intersection, where you have to follow the orange signs for a few minutes. After a sharp left turn you will reach the descent winding its way down to the bottom. Once you have reached the bottom, follow the path along the stream to the bank of Lake Baikal. This is an ideal location to rest since it has already been a 2.5 hour walk from Listvyanka. From this point to Cape Tolstiy the trail runs along the steep coast of the lake. This part of the trail is in very good condition and offers breathtaking views, except you have no head for heights. There is also an alternative route from Listvyanka to the GBT trail running along the steep coast, which should only be for the brave and sure-footed ones.This trail, though, should not be accessed when carrying a heavy rucksack as there are very narrow and steep parts which can be very dangerous. The trail at the steep coast of Cape Tolsti is planned to be built by the GBT workers in 2006. Its exhausting 45 minutes makes it the hardest part of the whole hike. After passing the remembrance stone of Vitali Aleksejevitsh Demetyev, the trail passes numerous small and large bays following the edge of the shore through several forests with grassland and fungi to the mouth of the stream Chernaja. It is also an ideal location for picnicking and camping. This area is frequently used by locals and tourists coming from Bolshiye Koty which is only 45 minutes away. The path from here to Bolshiye Koty is a wide sandy road also accessible by car. There are several stalls but they usually sell only alcohol, cigarettes, chips and fish. You start off this stage at the end of the town, following a good trail along the steep coast. After about 20 minutes follow the descent down to the beach until you get to Cape Sibiryakovo. After climbing up provisional stairs, the trail leads above the beach through a birch forest from where you can see the Skriper cliff massif. This massif (and the second one Zajatshi including the Devils bridge) is made up of gravel conglomerates that are very rare for the Baikal region. Several different types and colours of gravel are combined with red clay. After a short period along the steep coast you are going into the valley of Bolshaja Sennaya. After another 5 to10 minutes there is a steep path leading uphill located, right after crossing a little stream. Its a tiring climb over the shore scree until you reach the Zajatschi massif, leaving grassland and a beach at Cape Sobolev behind you. The path winding up the wall to the Devils bridge is yet to be seen if you follow the path along the beach right to the foot of the cliff. The Devils bridge is a 1m wide path which has been cut into the cliff. The handrail which once secured the path and offered some protection of the 10m abyss is no longer there. After descending the cliff massif with its beautiful views, the trail leads through colourful meadows in the core zone of the Pribaikalski National Park. At this point you should be aware that this area is strictly protected. Further on through meadows you go, and places where you can observe several kinds of birds, e.g. partridges. Finally, you reach Bolshaya Kadilnaya  which is a base of the National Park. Here you can find accommodation for the night. Camping is permitted in the core zone of the National Park. National Park Hostel; around 20 beds; 300-600 Rubel, Banya not incl. From Bolshaya Kadilnaya the path runs through meadows, pine and larch forests along the foot of the Primorski Mountains, which offer good views of the mountainous landscape til Malaya Kadilnaya. After this the landscape changes suddenly, and the mountains turn into a steep coastline. Here you have two choices, to either follow the path along the steep coast directly underneath vertical cliffs with dangerous areas caused by landslides or, you can opt for walking along the beach (just follow the path at the National Park sign). If you choose the latter be sure not to miss the wooden ladder that leads you to the other path again along the steep coast. The trail goes through thick pine and larch forest to the end of a long bay before you come to a private Turbasa you pass on the left hand side before reaching a second one shortly after. You can either walk through it or avoid it by taking the route on the beach. After you follow a treeless, steep slope for about 30 minutes. Here the core zone of the National Park ends. In the distance you can already see Bolshoye Goloustnoe and now it is only another 90 minutes easy walk. Above the beach there is a path leading through pine forest, taken by lots of campers, and which eventually meets the road leading to Bolshoye Goloustnoe, the final spot of this trail. 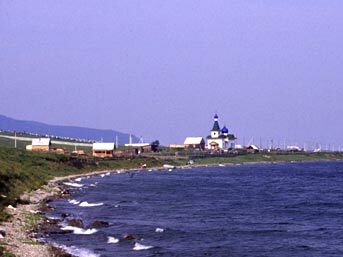 The village is situated at the edge of a large treeless river delta where the alluvium goes deep into Lake Baikal. There is a small church in the middle of the river delta which is worth seeing as well as a flood plain where you can find a few huge, old trees. Both places can only be reached by walking through the river, means your feet wont stay dry.